Street name: Old Pt. Wakefield Rd. On 19th February 1879, a number of enthusiastic members of the Church of England called a meeting at the Two Wells Court House to ascertain if regular services could be held in the town. The meeting was presided over by the Rev. Canon W.H. Coombs from Gawler. It was resolved that a Church of England service be held each Sunday in the township, to be conducted by one or more lay readers with monthly assistance as the Lord Bishop and the Synod might be able to supply. A committee was formed and a "list" opened for the purpose of receiving contributions to guarantee the expenses incurred in conducting Sunday services. Mr Robert Hoar wa appointed a lay reader and it was decided to contact the Institute Committee regarding terms for use of that building every Sunday for Divine Service. On the 7th March 1879, it was reported to the committee that an organ had been purchased at a cost of 32 pounds. In 1907 the congregation was ready to build their own church. Mr H.E. Fuller's plan was approved on 8th May 1908. The successful tender was won by Messrs Letton & Co of Mallala for $387 pound 10 shillings-without a vestry. The foundation stone was laid on 27th August 1908. More money had been raised and it was decided to include the building of the vestry. The total cost was 431 pounds. On 25th January 1909, the Bishop of Adelaide declared the new church at Two Wells open for public worship and dedicated the building to God's service under the name of St. Paul's Church. 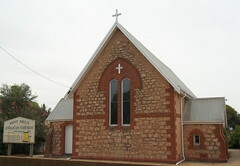 Some years earlier the Anglican Church at Virginia had closed and the Bishop of Adelaide, Right Rev Dr Thomas gave his consent for the furniture from this church to be used in St Paul's. The Venerable Archdeacon Brussel presented the brass altar cross. Most of the equipment and furniture is still being used. 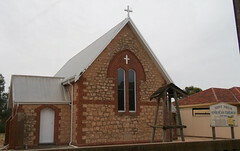 In 2009, Sunday services alternate between St Paul's Anglican Church at Two Wells and St. Peter's Anglican Church at Mallala. "Two Wells Then and Now" second edition by Bet Williams. Do you remember St Paul's Anglican Church ? Then Join up and add your memory here.